The fact that there is a water crisis has been acknowledged by various scholars but it is pointed out that the crisis is as a result of poor management practices, where water resources have been threated due to poor institutions and governance practices (Mollinga, 2008, Cosgrove and Rijsberman, 2000). 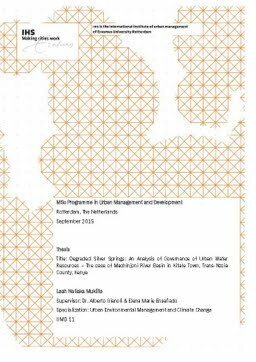 The purpose of this thesis is to provide an understanding of the manner in which institutional arrangements affect the implementation capacity of WRUAs in river basin management. The main research question is: How do the current institutional arrangements influence the implementation capacity of Machinjoni WRUA in river basin management? This was answered through 3 sub questions as follows: What are the key characteristics of current institutional arrangements related to river basin management in Machinjoni? What is the level of implementation capacity of Machinjoni WRUA in river basin management? How do legal framework and roles and responsibilities of organizations in water management affect the level of implementation capacity of Machinjoni WRUA in river basin management? Literature review indicates that in order to bring integrated river basin management into effect, institutional arrangements are needed to enable for stakeholder participation, water resources management on hydrological boundaries, an organisational setup in river basin and sub basin authorities with their respective by-laws to incorporate decision making at the lowest appropriate level, planning system oriented at production of integrated river basin plans and introduction of a system of water pricing and cost recovery (Jaspers, 2003). Stakeholders need to be structured through effective organizational and procedural arrangements so that each stakeholder group is aware of its own and others rights and responsibilities (Bandaragoda, 2000). Thesis Advisor Gianoli, A., Enseñado, E.M.